What’s the secret to a perfect Stir Fry? A hot wok, delicious Asian flavours and an adventurous spirit! From Cantonese to Indonesian cuisine there are so many stir fry meals to choose from, all with their own local flair. Salty, tangy, sweet, and sticky, there is a world of Asian flavour to be discovered in your wok. Singapore Noodles are from Singapore right? Believe it or not, they are actually very common in Cantonese Cuisine. You’ll find them in restaurants, teahouses and street stalls across Guangdong. These lightly spiced, fine noodles are packed with curry flavours, juicy prawns and crunchy veg. 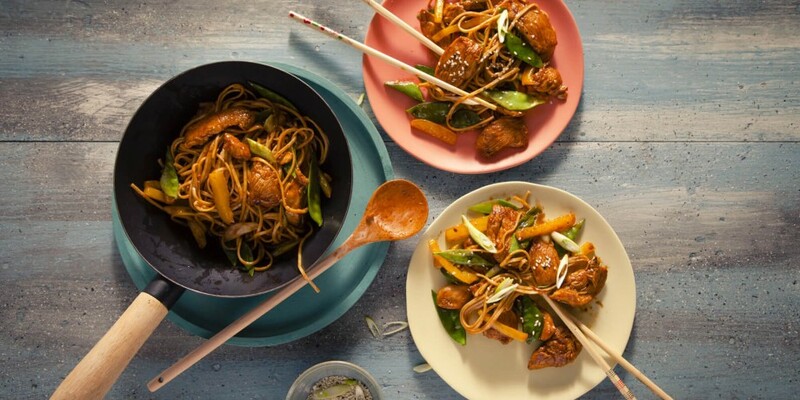 You’ll be slurping up the Chinese flavours of every last noodle! Beef Teriyaki is a Japanese classic but did you know this delicious dish gets its name from how it looks and how it’s cooked? ‘Teri” can be loosely translated to glaze and “yaki” to broiled. Our super speedy recipe will be ready in just 15 minutes and has all of the sweet and sticky flavour of your restaurant favourite. Think barbecue is just for summer? Bring those sweet and smoky flavours to your wok with our recipe for Chinese BBQ Stir Fry. A delicious blend of soy, ginger & cinnamon our Chinese BBQ Stir Fry Sauce with chicken, noodles and fresh veg will help you become a Blue Dragon Legend! Ready to try Indonesian cuisine? Chances are you already have! Satay originated in Java, Indonesia. Our Satay Season & Stir Fry is a rich blend of peanuts, coconut & chilli. Our recipe for Chicken Satay will leave your chicken perfectly seasoned and coated in lip-smackingly good peanut sauce. So, broaden your stir fry horizons and keep exploring with Blue Dragon recipes.